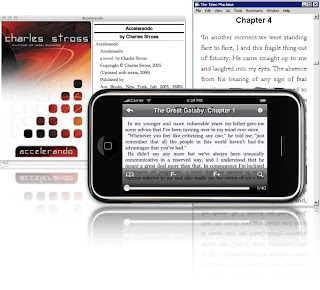 I recently downloaded both the OSX and iPhone version of Stanza, with the intention of turning my iPhone into a good pdf reader. The verdict? Stanza on the iPhone is awesome for reading newspapers, books and magazines. Stanza is bad for reading tech documentation, especially those with diagrams and pics. I had hoped that Stanza might be good for tech docs, but alas my hopes were dashed. I still use it on an almost daily basis though, since there's a lot of classic books that are now in the public domain. I have iPhone thumb, which is alternately known as blackberry thumb or nintendonitis. Trying to switch to my other fingers to give my thumbs some rest. 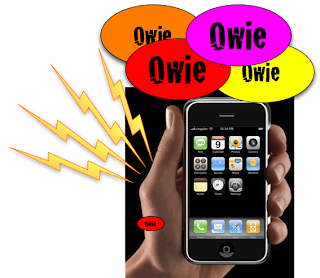 Owie. So I bought an iPhone 3G. I figured iPhones are no longer trendy since everyone and their mother has one, and Apple probably has most of the bugs worked out, so I might as well get one. So far I have been impressed. I ended up purchasing Omnifocus for the iPhone, as I really liked Omnifocus for the desktop. 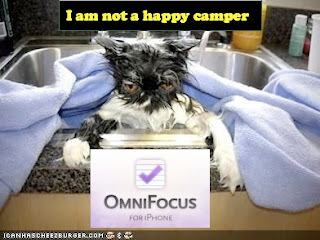 However, the Omni Group decided that there would be no recurring tasks on the iPhone version of Omnifocus. What the bloody hell. That's the most retarded thing I've seen this week, and it cost me $20 from the app store.